Routers and drills both work by rotating a bit secured in a chuck, or collet, but that's where most of their similarities end. A drill bores holes and is designed for downward pressure, while a router shapes edges and cuts grooves and is able to handle significant sideways pressure. This mechanical difference, among others, makes a drill unsuitable for use with a router bit. Drills lack the power and speed for effective and safe routing. A wide assortment of available bits makes routers capable of cutting such shapes as beveled edges, complex curves and roundovers, as well as flush-cutting laminate edges and cutting grooves known as "rabbets." Because of the powerful cutting action, kickback is always an issue when using a router. You must either clamp loose boards to a bench or work them with a router secured to a special table, a procedure similar to cutting wood on a table saw. Vibration is the enemy when routing -- it causes chattering and rough cuts that can ruin a piece of wood. A router spins at about 8,000 to 30,000 revolutions per minute, while the top speed of a drill is only about 3,000 rpm. Router bits are specifically designed for the higher speeds of routers. Running a bit too slow could easily allow the bit's blades to dig into the wood excessively, gouging the workpiece and jerking the tool, with potentially dangerous consequences. Routers have a wide, flat base that rests solidly atop the workpiece. This not only keeps the top-heavy tool steady during operations, it also controls the depth of cut for the router bit. Both controls are critical for precision and safety. Handheld drills have no base and no means for controlling depth. There are drill stand accessories that add depth control to a drill, but these are in no way designed for using the drill as a router. Drill presses have a solid base and depth control, and some machinists have set them up with special vises or jigs to perform very light-duty milling operations. However, the sideways forces of routing may be far greater than any acceptable sideways force on a drill press. A drill chuck doesn't hold the bit as tightly as a router collet, and a router bit is more likely to slip in a handheld drill or drill press. Apart from the fact that this makes the tool unreliable and potentially dangerous, it can also damage the bit by creating a series of grooves on the bit's shaft. After use in a drill a bit may not fit in a router again, or, if it does, it may suddenly break while you're using it -- imagine a sharpened carbide blade that's spinning 500 times per second becoming airborne. 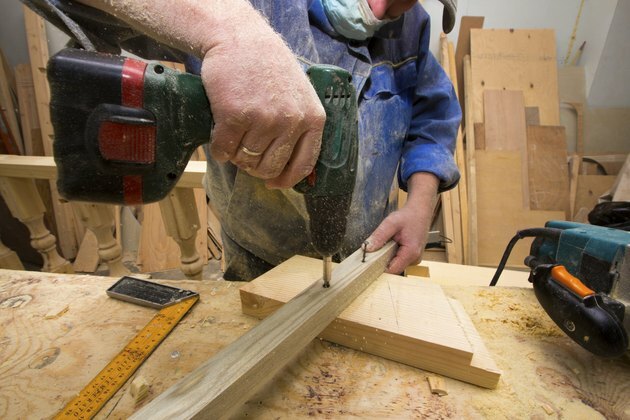 Because a drill isn't designed for the sideways forces associated with routing, using a drill as a router may damage its gears, whether it's a drill press or a handheld tool. Additionally, drill press chucks are often fitted onto tapered posts, and applying excessive sideways force can cause a chuck to come loose.